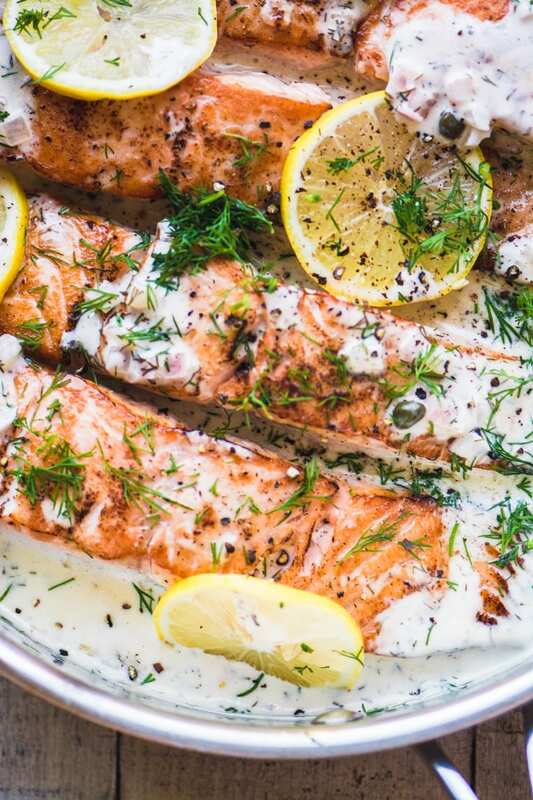 Creamy Lemon Dill Salmon ~ an easy dinner that never fails to please. 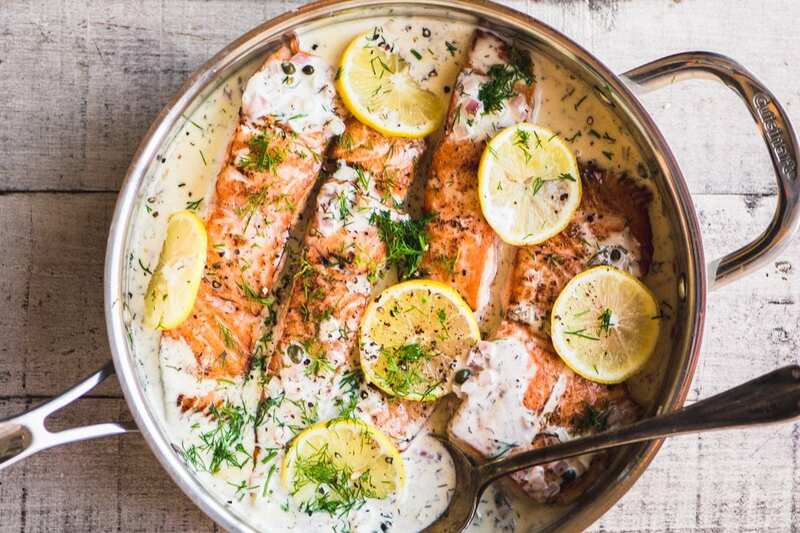 The salmon is succulent because it’s bathed in a creamy wine sauce perked up with lots of lemon juice and fresh dill. It almost doesn’t matter what you serve with it, all attention will be riveted right here. shallots ~ they have a subtle but distinctive flavor. wine ~ when wine is reduced down it lends a sophisticated complexity to the sauce. heavy cream ~ because…you know. capers ~ you get a little lemony tang in every bite. 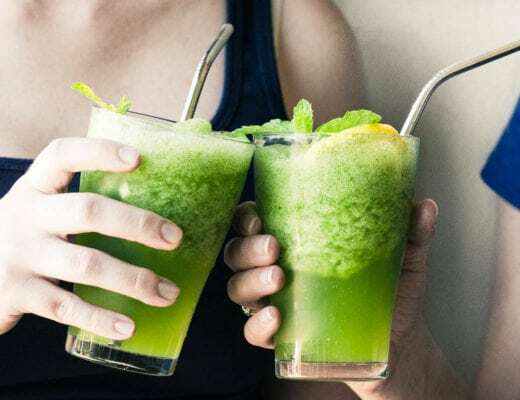 fresh herbs ~ fresh herbs are an affordable luxury that makes a huge difference in the overall experience of so many dishes. Shallots are part of my weekly shopping, I always pickup a few, and keep them with the onions and garlic in a hanging wire basket in my kitchen. They come in handy for everything from scrambled eggs to this salmon dinner. TIP: I use shallots in place of onions and garlic in lots of recipes…they have a more pronounced flavor than onions, but aren’t as sharp as garlic. They’re the Goldilocks of the allium family. I like to serve this Creamy Lemon Dill Salmon on a big bed of wilted spinach to offset the richness of the cream sauce. In any event it makes me feel a little less guilty for enjoying all that cream. That the heck are capers, anyway? Did you think they were fish eggs? I used to think that too, until I learned that they’re the little unopened flower buds of a Mediterranean bush that have been dried and pickled. 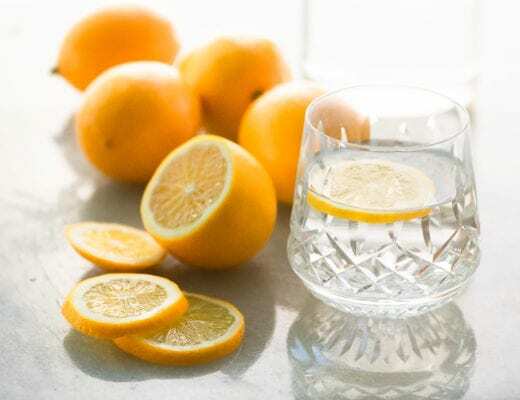 They have a tangy lemon-like flavor and work really well in salads, and with fish and chicken. So next time you see a little bottle of capers at the supermarket, pick it up, it will last months in the refrigerator, and they’ll perk up your cooking. Lightly coat the bottom of a large skillet with olive oil and heat on medium high heat until hot but not smoking. Season the salmon on all sides with salt and pepper, and then sear it on both sides. Remove the salmon to a baking sheet and bake for 12-15 minutes, or until just done through. Meanwhile make the sauce by adding the shallot to the browning pan and saute for a minute or two to soften. Add the wine and let the wine bubble away to reduce for a couple of minutes. Add the lemon juice and cream to the pan and bring up to a simmer. Add the fresh dill and the capers. Add salt and pepper to taste. When the salmon is done, add it to the pan, nestling it down into the sauce. 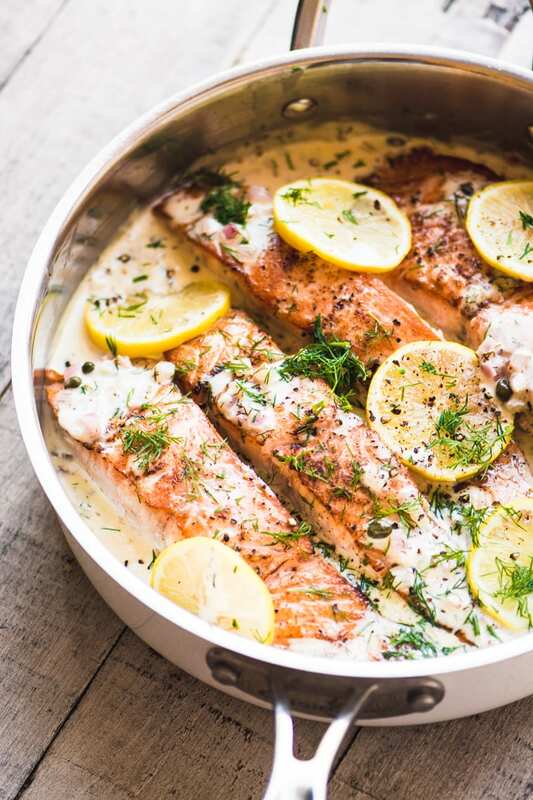 Spoon some of the sauce over the fish, and garnish with lemon and more fresh dill. Serve right away on a bed of wilted spinach, with couscous or a rice pilaf on the side. Make a lighter lemon sauce using the Greek egg thickening method, you can see it in my recipe for CHICKEN IN LEMON SAUCE WITH OLIVES. The sauce will be silky, thick, and lemony, without any cream at all. If you aren’t a dill fan, you might try tarragon. Don’t forget to pin this Creamy Lemon Dill Salmon to your dinner board! I don’t see why you couldn’t make this ahead, but you would need to gently reheat both the salmon and the sauce so the salmon doesn’t get overcooked and the sauce stays nice and creamy. That is really great to know, Alexandra, I’m always looking for ways to make creamy lemon sauces lower in fat. I’ll try it next time! This looks so stunning! I love salmon but usually go with a lemon / pepper / alfredo type of dish when I make it. I definitely want to try your recipe! Thank you for sharing! Question. I’m lactose intolerant and can’t do the cream. Is there a vegan alternative that you recommend in lieu of the cream for this recipe? Thanks! That’s a tough one, Ashanti. 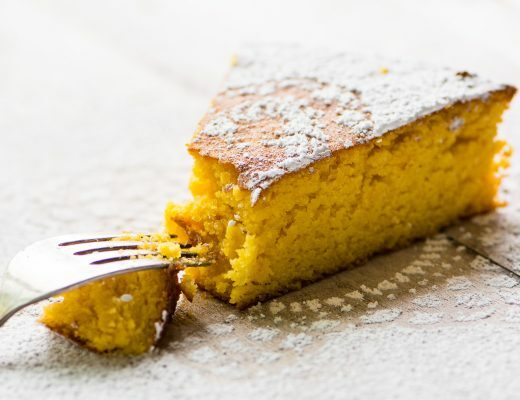 Coconut milk is the most common substitute for cream in lactose free recipes where cream is needed, but I’m not sure how it would work with the flavors in this dish. Thanks Albert ~ I save this creamy treatment for special occasions, but it really is tasty :) Hope you love it! Great recipe Sue! 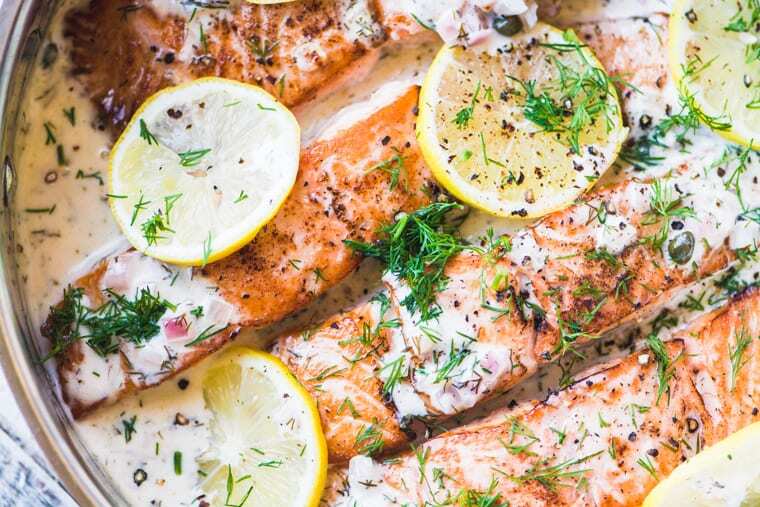 We eat salmon a lot so this is our kind of recipe ! 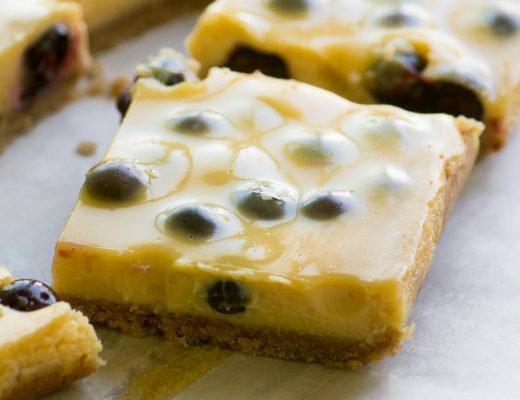 Love the creamy lemony sauce with capers in this one -can’t wait to try this recipe! Photos look so good they’re making me hungry! What do you think about using Greek Yogurt in lieu of cream. Always have salmon in freezer and Greek Yogurt in refrigerator so could be a last minute addition. Don’t have fresh dill, but do have fresh tarragon in my herb garden. That’s an interesting question, Schatzi. Yogurt doesn’t heat up very well, it can curdle. 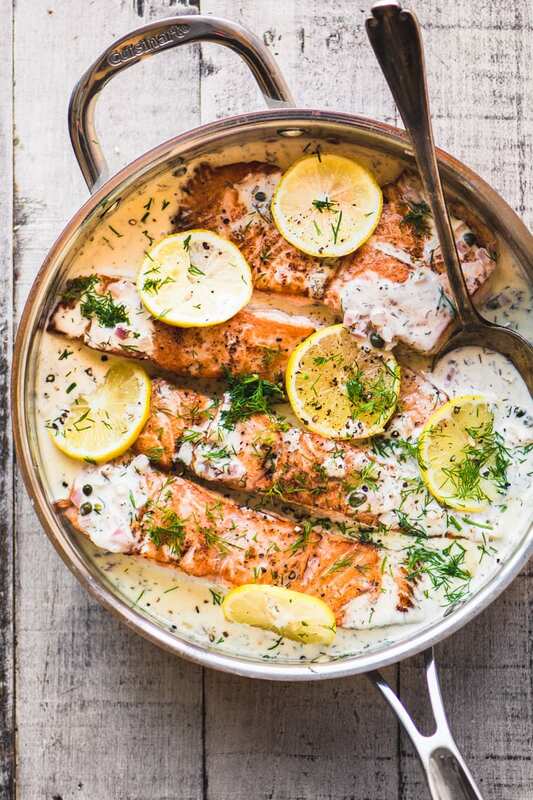 If it were me, I might cook the salmon as above, and then serve it with a cold yogurt/lemon/tarragon sauce. We eat a lot of salmon and I always appreciate new recipes. What an elegant presentation Sue. I also clicked on your salmon zucchini cakes . I pinned both. I’m so glad you clicked through to the salmon burgers, those are so good, they’re our go-to recipe in summer. We eat a lot of salmon, too, it’s just so hard to track down affordable wild caught! Chris is right, I want to have someone over to dinner so I can serve this beautiful dish! Great recipe Sue – a company worthy treat for sure. This is a gorgeous, dinner party worthy meal! I love the simplicity and elegance, well, everything about it! I love salmon, well, who doesn’t? I usually prepare them with just ginger and salt. Have never made them with creamy sauce. Looks so yum, Sue. I’d love to get your recipe Angie, I’m wondering if you mean fresh ginger? It sounds intriguing!